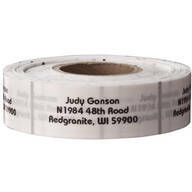 Clear address labels roll gives the look of stationery without the expense. 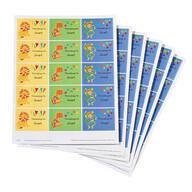 These clear address labels are self-stick and see-through, so they look custom-printed on an envelope. 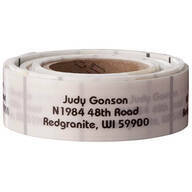 Specify name/address; limit 5 lines, 25 letters/spaces per line. 2" L x 5/8" W. 250/Roll. 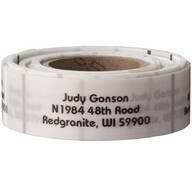 Clear address labels roll gives the look of stationery without the expense. Our clear address labels are self-stick and see-through, so they look custom-printed on an envelope. 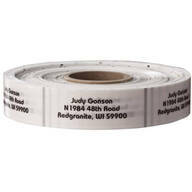 Specify name/address; limit 5 lines, 25 letters/ spaces per line. 2" L x 5/8" W.